Holiday News Archives - ID Studios, Inc.
We hope Santa’s Elves deliver a NICE report to the Big Man this Holiday Season. One of the greatest joys of this season is the opportunity to say thank you to those who have made our success possible. We wish you a wonderful Holiday Season and a peaceful, prosperous New Year. It’s that time of year again. We hope we can bring some HAPPY to your Holiday Season. ID Studios Celebrates Halloween in Style as we dressed up and carved pumpkins. 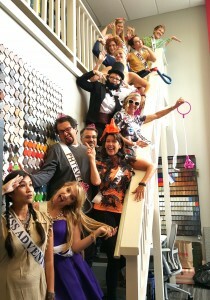 This year, one of the designers brought in ribbon and many people picked up on the Beauty Pageant Contestant theme. From left to right: “Whale and her Calf” “Mummy” “Trumpkin” and, of course, a “Minion”. The good people of TS Restaurants corporate office voted and picked Minions as the winner. Congrats to Steven and his team! We’ve had a wonderful and memorable 2014. We’d like to take the time to thank the friends & family, the employees & clients and the vendors & contractors that helped make it happen. Thank you to T-Squared Professional Engineers for organizing this years food drive and thank you to everyone who helped fill our barrel. We hope your overall event is a smashing success! Follow-up: Through this food drive, the AEC industry food drive provided 3248 meals to local families in need. 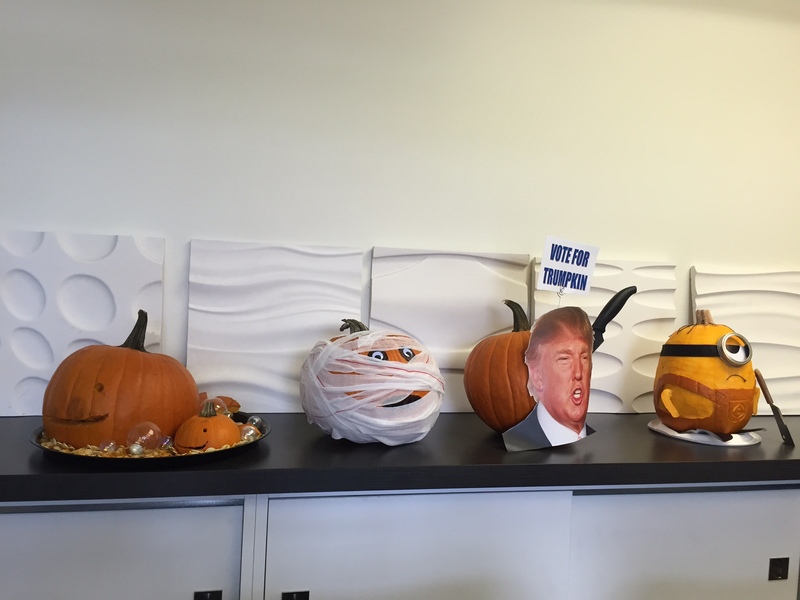 Today at ID Studios we held our annual pumpkin carving contest. We all started with a whole pumpkin and a set of carving tools but aren’t limited to only using the tools; we can use anything around the office to decorate the pumpkin. In year’s past people have even brought in their own tools or items from home. This year everyone stuck with things around the office. Here is what the creative minds of our staff “spooked” up. 1. “Monday Mourning” Inspired by the day of the dead, this beautifully detailed pumpkin included graveyard accouterments created with fabric from our library. 2. “A Pumpkin’s Life for Me” Yo, ho, yo, ho. With the ocean just outside our window, it’s no wonder this team came up with an imaginative pirate ship accessorized with chop sticks from the kitchen! 3. “Holy Ghost” Using floating bags woven in and out of carved holes and finished with googly eyes, this pumpkin screams Halloween. 4. “It’s Lunch Time” appropriately named since our contest takes place at lunch, the stem creates the perfect fusion of burger and pumpkin. The contest will be judged by an independent jury and social media so visit our sites and weigh in. The winner by ONE VOTE was #4, “It’s Lunch Time” second place went to #1 “Monday Mourning” and third went to “A Pumpkin’s Life For Me”. Thank you to everyone who voted on social media. It’s Christmas here at Solana Beach. Here they are are “topping off” the Christmas Tree by the Sea. 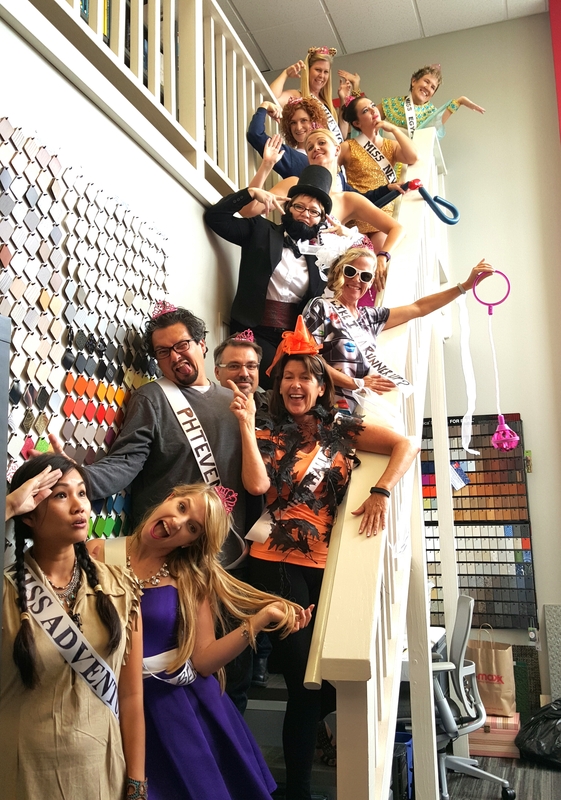 Every year we get into the Halloween spirit by dressing up in the office. Here is a peek inside the studio to see the creative forces at play!